Psionics is the ultimate sourcebook for psi powers. It includes a complete world background – and the GM can use it as a resource for campaigns in any background. Unified Rules – the psi systems from GURPS Basic Set Third Edition and GURPS Supers combined into a complete, official whole. 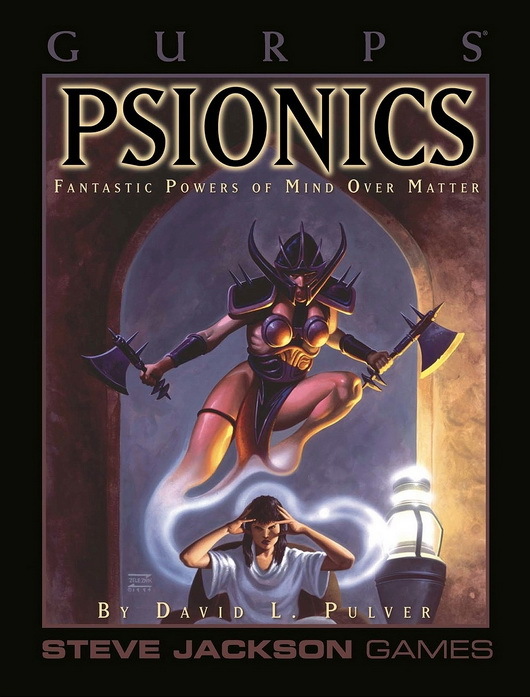 Psionic Abilities – including Mindswitch, Combat Teleport, psychic vampirism and cyberpsi. More Rules – featuring gestalts, group minds, latent psis, ghosts, psionic combat and poltergeists. Psionic Technology – two chapters of psionic equipment, including psychotronic weaponry, dreamscanners and psionic computers – even psionic starship drives! Campaign Advice – on smoothly integrating psi into other GURPS worldbooks, or designing your own psi campaign. Complete Campaign Background – in which powerful psis struggle with secret with secret government agencies and globe-spanning conspiracies in a world eerily like our own . . . Already converted to Fourth Edition? GURPS Powers covers all of the mechanics from this book, though it doesn't include the setting information.